Buying a pair of dress shoes is an investment and you want them to last a long time, especially if they are expensive. 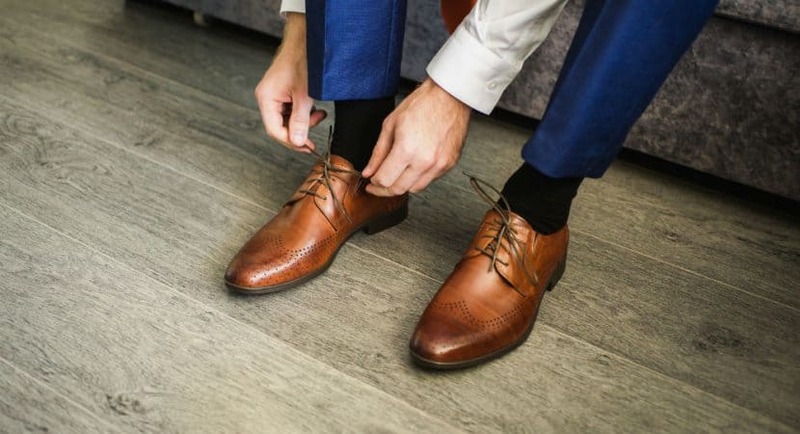 One question that gets asked very often is: “How long will my dress shoes last?” The trouble is that this is a complicated and open-ended question. We all have our own expectations for the longevity of a pair of shoes when we buy them. We’ve already very much established that the key to getting longevity out of your dress shoes is to buy quality. Shoes should be designed and manufactured to last. It is also important to ensure that you and your cobbler are on hand to regularly look after and maintain your shoes so that they remain in their most optimum condition. You wouldn’t buy an expensive car and then leave it on your driveway to rust, never cleaning it, ignoring the warning signs when it was ready for a service and neglecting the important repairs that keep it running smoothly. Similarly, if you want your dress shoes to last, then you need to have exactly the same conscientious attitude to looking after them. Statistics from the Shoe Service Institute of America reported that back in the 1930’s when classic leather shoes and elegant style were very much at their hey-day, there were over 100,000 shoe repair shops. Fast forward to today when there are just 4,300. Is that because the cobbling industry is out of fashion and no longer required? Or could it be that shoes are too cheap these days to bother with the expense of getting them repaired or re-soled? Are quality shoes no longer seen as a viable investment and have they become altogether more disposable with the prevalence of Asian imports and the growth of online purchases? There is one thing for sure, if you buy quality, it will last and your cost per wear will be reflected in that outlay as you continue to get years of wear and dependability from your dress shoes. You do though need to hand them over to a professional for expert maintenance to keep them in tip top condition. For your shoes to last, look out then for solid and quality construction and design, use of durable natural materials like leather as opposed to vinyl and synthetics, and also ensure that you have the right fit. By that we mean to have your feet properly measured and consider the important of length, breadth as well as your instep. What Factors Affect the Life of Your Dress Shoes? Even if you consider all of these factors and more to determine the average lifespan of a particular pair of shoes, life is filled with unexpected turns. You might estimate that your shoes should last at least a year and then tear your shoe against a sharp object tomorrow. You could get caught in a rainstorm and soak your shoes and not have a chance to dry them out properly for an entire week which may leave them damaged. These examples show that there is not a definite way to say how long a pair of dress shoes will last. Largely, it’s going to depend on how often you wear the shoes as well as how well you look after them. In some cases, people can get a high-quality pair of dress shoes to last for years by taking fantastic care of them and not wearing them every day. There are so many variables to consider, so the life of these shoes can really vary! How Long Can I Expect a Pair of Dress Shoes to Last? It’s not an exaggeration to say that well maintained, quality leather shoes can literally last for years so what might have initially felt like a cost, is actually an investment. In 2008, archaeologists discovered recognizably still intact, a 5,500-year-old pair of bespoke hand stitched leather shoes. Now how about that for wearability and durability? The quality of leather and the price of the shoes will govern how long your shoes are likely to last. Anything that costs less than $100 is unlikely to be made from genuine leather and is designed to be worn through within the space of 6 months. If you want to invest in a good pair of leather dress shoes, it’s best to avoid the cheaper options. If you are spending between $100 and $180 on a pair of leather shoes, you can expect one of two outcomes: Bad and overpriced shoes that will fall apart quickly or a decent pair of entry-level shoes. Either way, shoes in this price range are unlikely to be made from top quality leather. You can expect genuine leather, although it might be top grain or corrected grain leather. Depending on how the soles are attached, you can expect anywhere from 6 months to 2 years until they wear out. In the price range of $180 to $300, you can expect quality leather shoes. This range often offers leather soles too, which increases their longevity. The upper part of the shoe will also be made from higher quality leather which is known to be much more durable and breathable. This means your feet will sweat less, preserving the inner lining of the shoe. You can expect between 1 and 5 years until these shoes wear out. If you can afford to splash out more than $350 on a pair leather dress shoes, you know you will be getting great quality, handcrafted shoes. Shoes in this price range are likely to last between 2 and 10 years, provided they are cared for properly. It is important to note that many designer brands may have a higher price tag while still not being the best quality since their focus is on design rather than durability. Expect them to last as long as a pair of shoes in the price range below. Caring for your shoes will greatly affect how long they last, regardless of price or quality. Thus, it is advised that you invest in a more expensive pair of leather dress shoes and learn how to care for them. This will not only save you money in the long run but will also save you the time and effort of shopping around to replace your shoes every six months. They will also look a lot better and more fashionable. While you might also think that a shoe tree is a bit of a novelty, again, looking after your shoes by retaining their proper form and shape really will help retain them for longer. So think twice before you buy cheap shoes and instead consider the long term investment and years of wear you can enjoy if you just invest some time as well as money into looking after your shoes. Be sure to regularly polish your dress shoes. This act alone can significantly increase the lifespan of your shoes. The more you wear your shoes, clearly the more they are going to flex and it’s that flexing of the leather than can expose your shoes to moisture from the elements and other harsh environmental and chemical compounds. So just the very act of taking your shoes and polishing them, really does help create a protective coat. Not only does polish keep your shoes looking sharp and shining, but regular polishing can also repair any damage your shoes get from day-to-day wear. In addition, the polish also nourishes the leather, extending the shoes’ lifespan by keeping them healthy and flexible. If you aren’t sure about what kind of shoe polish to use, you can always consider asking a professional. Someone who works at a shoe store, particularly one that caters to leather shoes, will have a good idea of the polish that will work best for your shoes. Otherwise, there are a number of online resources that can help you to find the perfect solution to take the best possible care of your shoes. Before wearing your shoes for the first time and regularly afterwards, apply a water repellent. This will ensure that excess water does not affect the leather’s elasticity and will prevent any stretching. Good water-based water repellent will protect the leather from too much moisture while keeping it from drying out too much. It’s a great tool to have for just about any pair of shoes, but especially for your high-quality leather shoes. It’s important to make sure you get the right brand for your specific shoes to ensure the best results. A good pair of cedarwood shoe trees will help extend the life of your leather shoes by filling them out when you are not wearing them. This prevents the leather from shrinking or creasing. Cedar is the most recommended material for shoe trees as it absorbs harmful moisture and odors. It’s also a good idea to make sure you use a quality shoe stretcher rather than one of the more experimental options out there. Methods like using a hair dryer or freezer may seem appealing because they claim to work more quickly, but they can easily do some serious damage to your shoes. Before using a polish, cleaning your shoes with a quality shoe brush can be a great idea. This helps to get any dirt, dust or other debris off your shoes that could otherwise get caught in the polish. After using a brush, you’ll be able to get much better results from your shoe polish. Generally speaking, a horsehair brush is a good option, but you’ll want to make sure you get the right brush for your specific shoes. It can really be a great tool to have around and is more important than many people might think! One of the best ways to avoid wear and tear on your shoes is to clean them regularly. This keeps them looking great and keeps the material they are made from in good shape. It’s important to remember that there are a variety of cleaning methods depending on what your shoes are made out of. For example, with leather shoes in particular you’ll want to use the horsehair brush to get rid of any surface dust or debris. Then follow that up by wiping the shoe down with a damp, warm cloth or sponge. After that, you’ll want to use your waterproofing product. Shoe polish doesn’t need to be applied every time if you clean your shoes more often, but you will want to use it about once a month to keep the leather in good shape. Leather soles need to be cared for just as you care for the leather upper. “Taps” can be fitted by a cobbler to protect your soles from constant contact with the ground and the shock absorbed when walking. Occasionally, you might need to replace the soles just as you would replace the tires on your car. The upper part of your dress shoes tends to last up to four times longer than the soles, so it will probably be necessary to replace the soles at some point. This is also going to help you to stay more comfortable while wearing them!